Bedford Athletic prevailed in a tough contest against their visitors from Bugbrooke by six tries to nil in Midlands One East. In a match in which both forwards and backs faced a significant step up compared to the challenge posed in the previous week, Athletic rose to the occasion and secured a thumping 38-0 victory. The home side were on attack from the start of the game and the breakthrough came on seven minutes when Andy Ince touched down for a 5-0 lead. The advantage was extended after 24 minutes as the ball was turned over at a ruck in the Athletic half and then quickly transferred to the opposite wing where Stephen Woodhead was on hand to sprint away under the posts for a second try. James Mortimer converted for a 12-0 lead. Bedford picked up where they left off at the start of the second half and were rewarded with a fine try on 43 minutes as Ben Middleton went over for the third score of the day, which was again converted by Mortimer. Ben Johnson went over for his fourth try of the campaign to secure the bonus point with 49 minutes on the clock, while resilient midfield defence from man of the match Steve Smith and Tommy Mills kept Bugbrooke at bay. The next score arrived when Charlie Darlow was at the end of a pacy counter attack to go over for a converted try to further extend the Bedford advantage. Then entering the final 10 minutes, when Bugbrooke were visibly tiring, Athletic kept the pace up to work a second try of the day for Woodhead which Mortimer converted for a 38-0 final scoreline. 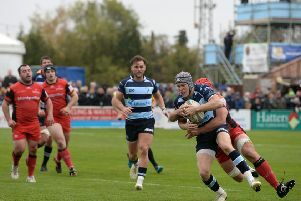 Two home matches have yielded two bonus point victories for Athletic so far this season, however a real challenge comes this Saturday as Bedford travel to early league leaders Derby.